With over 19 million immigrant women and girls in the United States, it’s important that as a female and an immigrant you feel protected by the law. Coming to a new country can be scary enough without the added factor of domestic violence. From learning a new language to feeling alienated, entering a foreign country can be hard enough without being hurt by your loved ones. With the utmost confidentiality and discretion, the lawyers at Zohar Law PLLC, a law firm in New York City, can help you figure out what to do when you are in a foreign country while facing domestic violence. Equipped with immigration information, you’ll be able to determine your own path for the future, so you can move forward. Domestic violence comes in multiple different forms. As an immigrant in America, there may be some culture shock, which is why it’s important that you understand what domestic violence is in the United States. First, domestic violence can happen to anyone. If you’re a man, you aren’t immune to experiencing domestic violence. If you’re older, it’s not impossible for you to experience domestic violence. Domestic violence can happen to anyone who is in an unhealthy relationship with another person. Domestic violence rears its head in many different forms from mental, physical, and emotional abuse. Domestic violence occurs when there is a pattern of violence, emotional, or mental abuse to another person who is a spouse, partner, child, elderly person, or a parent. Domestic violence can include sexual relations, emotional manipulation, child abuse, intimidation, economic and immigration threats, and other violent crimes to another person. When you’re an immigrant, you may not think that you have the same legal rights as other people. Even if you are living in America as a foreigner, you still have the accessibility to legal rights, especially as a domestic violence victim. You are guaranteed the very basic protection under the criminal and civil law as an immigrant. When you’re living in America as an immigrant, you and your family have the legal rights to be protected. You also have the right to separate or divorce from your spouse without consent, you have the right to marital property and a divide of your property if you are going through a divorce. Furthermore, you have the right to get custody and financial support while going through a divorce. If you’re a victim of domestic violence, you can also go to a court to apply for a protection order. You’ll need evidence and you’ll have to talk to the police about the abuse in the past, present, and show any recent injuries. No matter what your immigration status may be, you can report a crime to the police and apply for a protection order and go through a divorce regardless if your spouse is an American citizen or not. What Happens If You Are Married? If you are married, regardless if your spouse is an American citizen or not, you still have legal rights. If you came over to America to be with an American citizen and are experiencing domestic violence and he or she holds the reigns of citizenship and money over your head, you can still get a citizenship without your spouse or partner. If your spouse and you moved here from another country and he or she is holding access to citizenship, you can still become a citizen without your significant other. If you want to leave your spouse because they are abusive, you’ll need some evidence so you can divorce him or her to apply for your own citizenship. Some of the types of evidence you’ll need to divorce your significant other is a marriage certificate if you are married, a birth certificate if you are trying to get away from a parent or child, and evidence that you lived together. Additionally, you’ll need police reports, civil protection orders, evidence of the abuse, and affidavits of witnesses who know about the abuse. These are just some of the types of evidence you’ll need to file for citizenship as a victim of domestic abuse. Remember to always gather your evidence secretly, so you and your loved ones can remain safe from your abuser. At Zohar Law PLLC, The Violence Against Women Act or the VAWA is one of the services we offer. 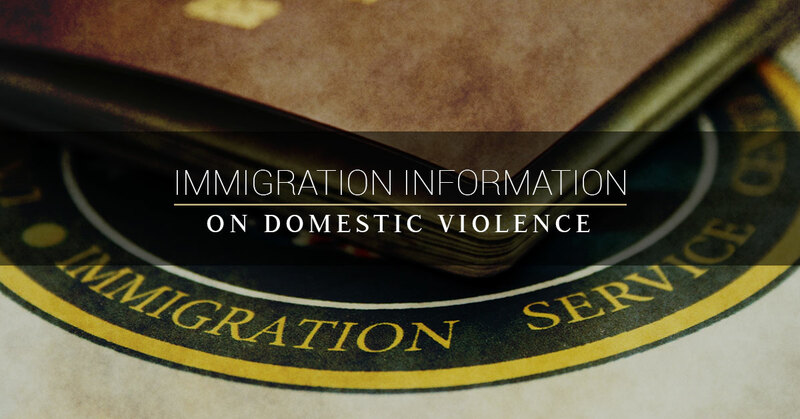 By providing immigration information to both men and women who may be facing abuse, we can help you take the steps to become a citizen without your abuser. VAWA green cards can be helpful for those who are victims of domestic abuse to get a citizenship without the knowledge of the abuser. As an immigrant, many times citizenship is held out of reach by the abuser, especially when money is added to the equation. The VAWA green card eliminates you needing anyone else to become a citizen. Learn more about VAWA Green Cards by taking the time to talk to an immigration lawyer who can assist you in a discreet manner on becoming a citizen.